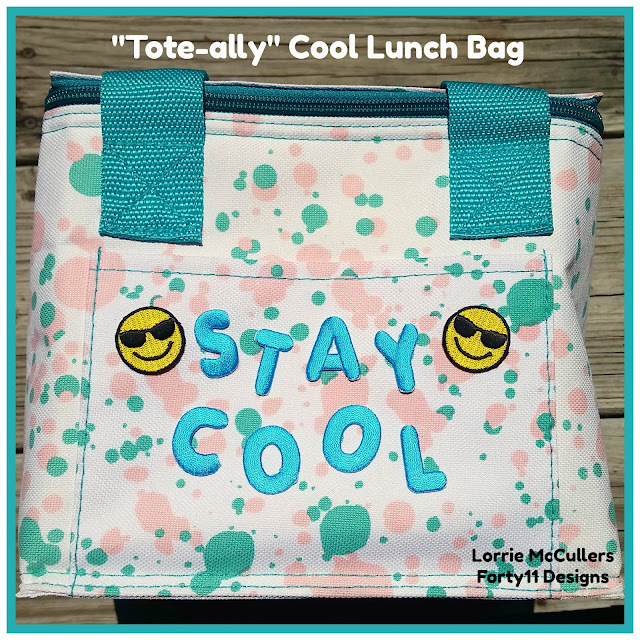 This insulated lunch bag will take you from icy drinks by the pool in the summer to cold lunches at school in the fall! Using JOY iron-on Chunky Letters and Iron-on/Stick-On Emojis, I took a plain lunch bag from boring to "cool." The lunch bag I used has a canvas-type fabric on the outside so it was easy to iron on the aqua letters that matched the bag. 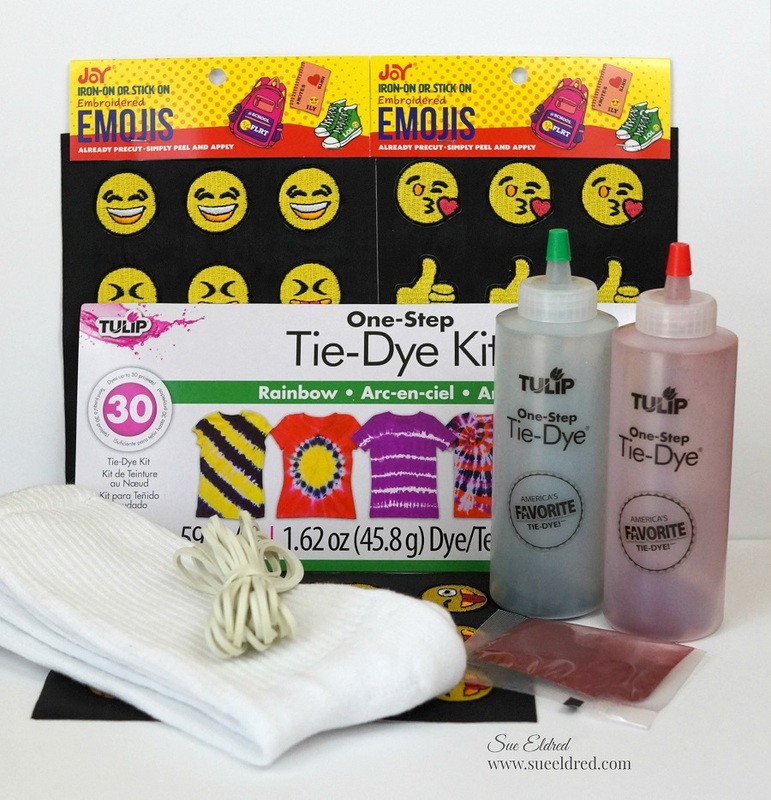 Then I added two of the fun embroidered emojis -- love those little guys -- to highlight the "Stay Cool" lettering. You can find these Joy® letters and emojis at Michaels, Hobby Lobby, Amazon, and other craft retailers! 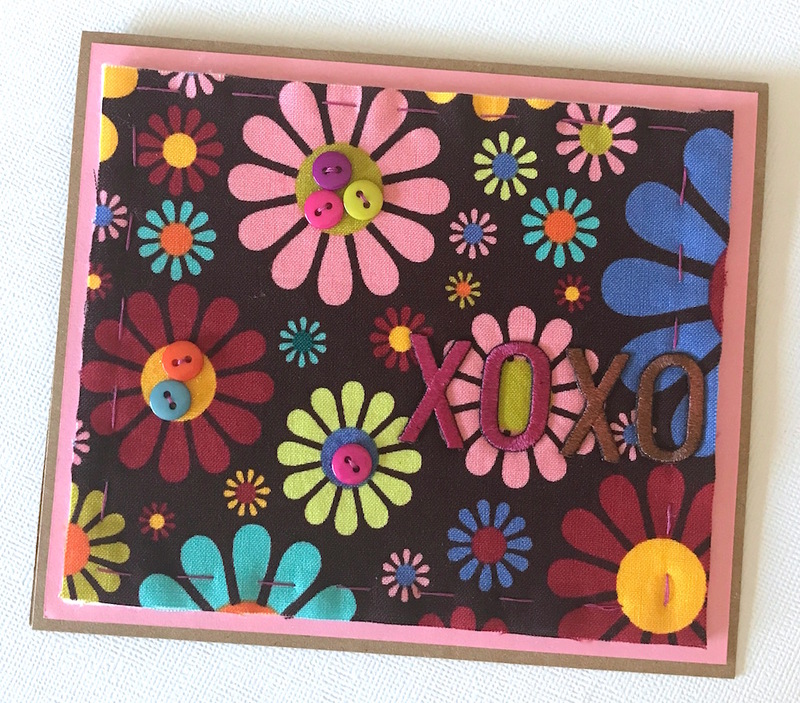 Fabric is so soft and yummy - try it in place of paper for your next handmade greeting card design. Plus you can easily iron on Joy embroidered letters to spell your sentiment like I did with hugs and kisses. 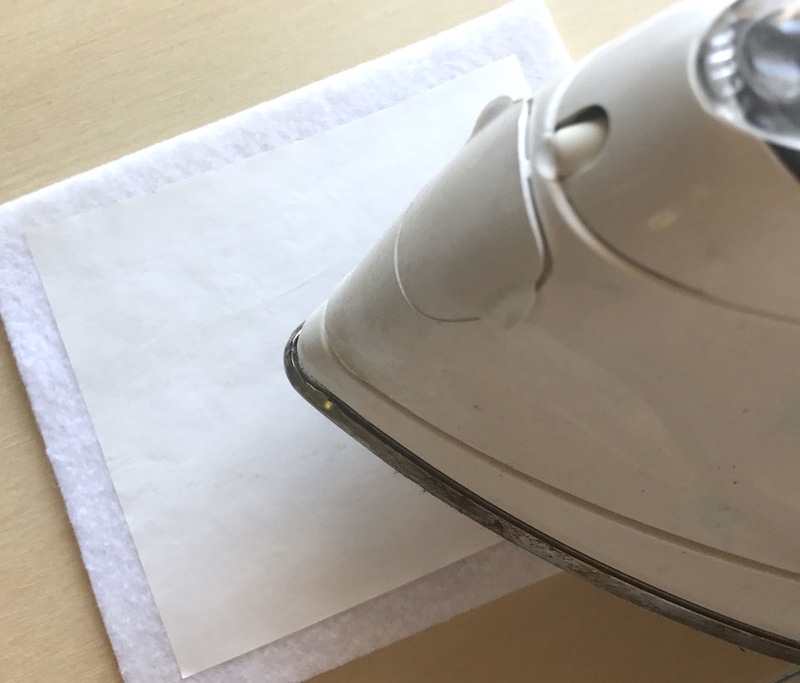 Iron a piece of paper-backed fusible web interfacing (tacky side down) to a piece of wool felt. Peel away the paper liner to reveal the adhesive, place your fabric on top and iron to adhere. Trim your sandwich to fit within your desired card dimension. 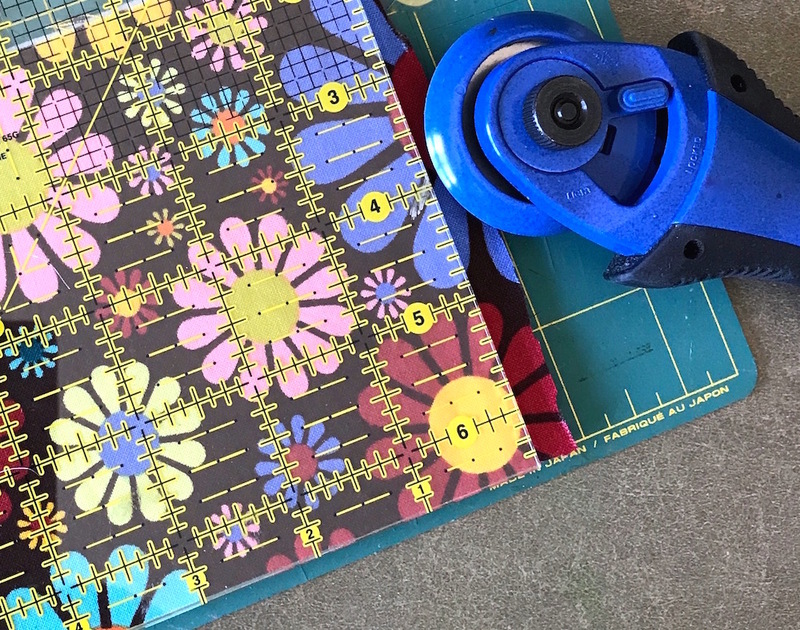 Use a rotary cutter with a quilting ruler and cutting mat to get nice clean edges. Use a pinking blade if you're concerned about frayed edges, but the fusible in the middle will also prevent fraying. Stitch a little border around the edges by hand or machine with a contrasting thread color. 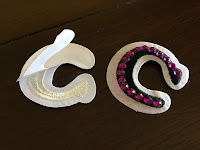 Iron your embroidered letters into position, then embellish with buttons or bling however you like. I colored my Xs and Os with markers to match the fabric. 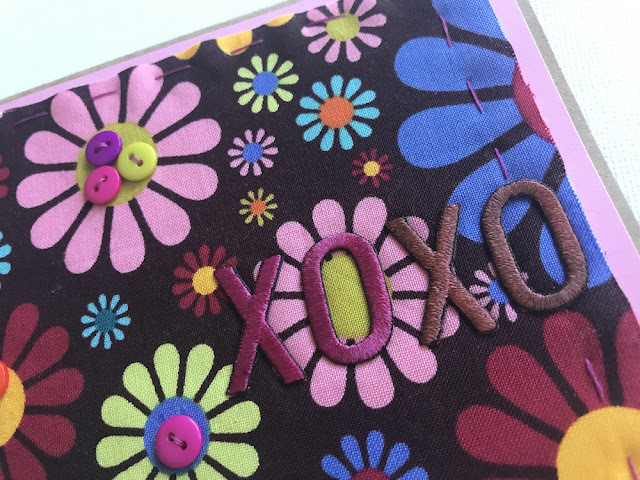 Mount your little "quilt" on to card stock with a thin coat of fabric glue or a multi-surface adhesive sheet. 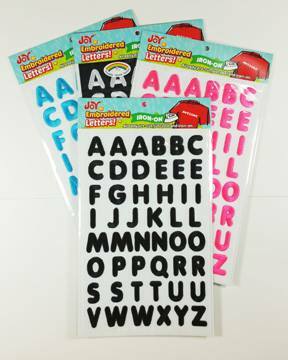 Joy iron-on embroidered letters are available at craft stores in a wide variety of sizes, fonts and colors. 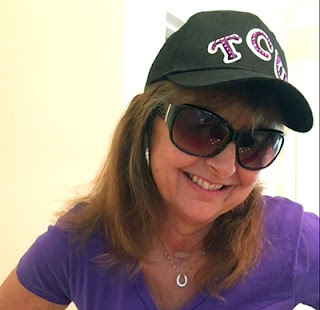 We're big fans of Texas Christian University and try to make it to the home games. T-shirts are easy to find for me, but a hat that fits.... NO WAY. 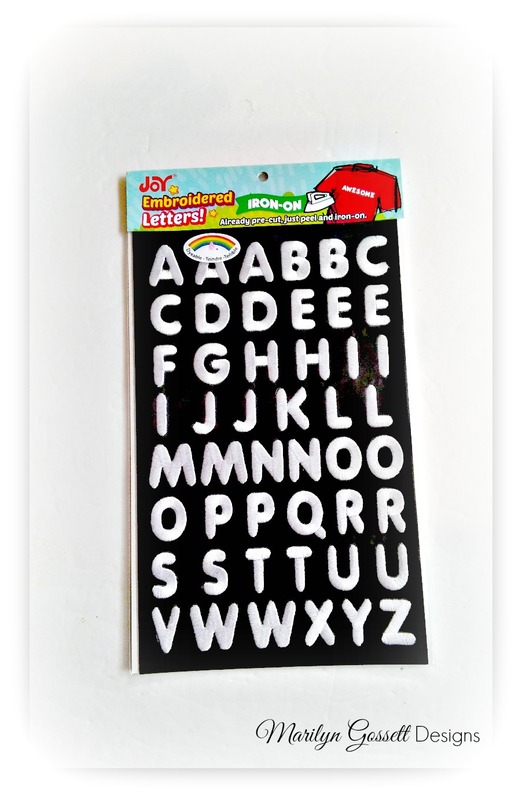 Joy® iron-on letters to the rescue. 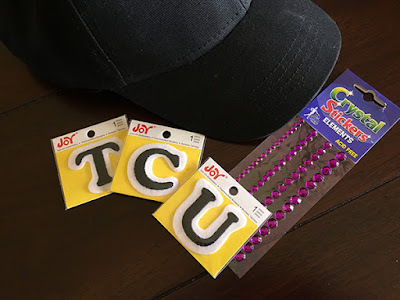 I found a child's black baseball hat that fit me to a "T" (as U will C), then decorated it with iron-on letters, embellished with TCU purple adhesive jewels. 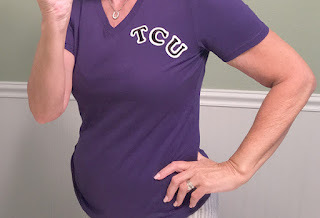 I added a second set of letters to a purple shirt I had, but without the bling, since it will probably need to be washed often. 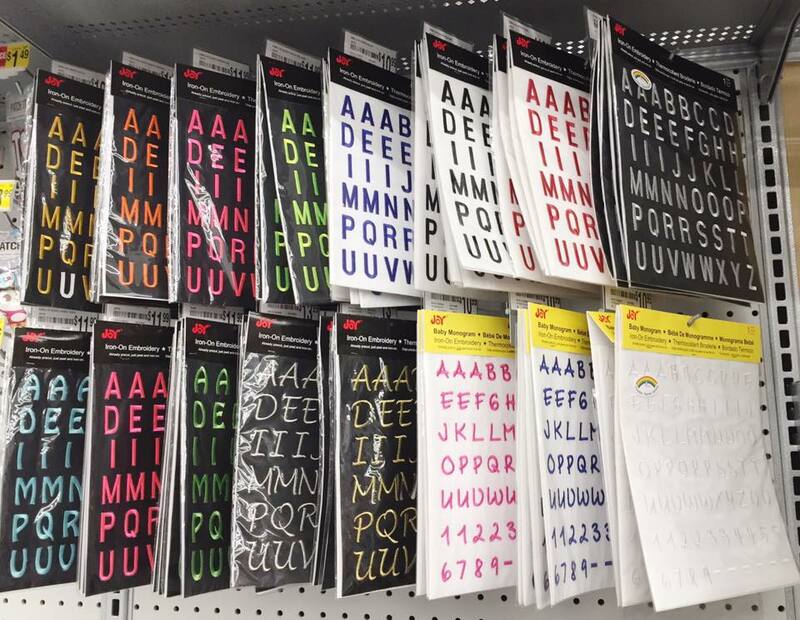 White, dyable letters can also be colored with fabric pens, fabric paints and more allowing you to customize your apparel for any school or college team. Now I'm ready for tailgating and kickoff - how about you? GO FROGS!! Joy iron letters are available at your local craft stores in a variety of fonts, sizes and colors, including white, which are dyable. Keeping track of your keys just got a little easier with this personalized keychain! I picked up this burlap wristlet keychain at a craft store and then just added my initials using JOY iron-on embroidered letters. After ironing on the letters, I embellished the keychain using coordinating buttons and mini pearls for a beautiful finished look. Super quick and easy! Looking for a fun summer project to do with the kids? 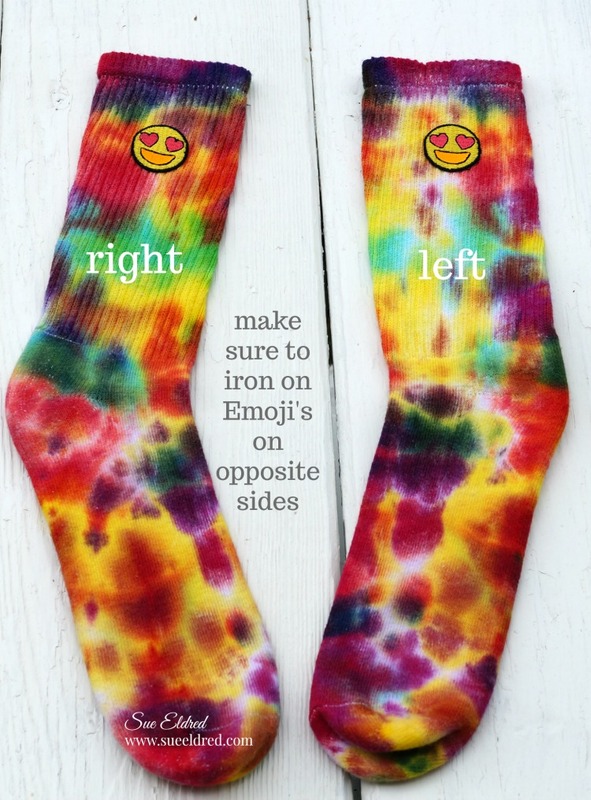 How about one-of-a-kind tie-dyed emoji socks? The kids are going to love this! 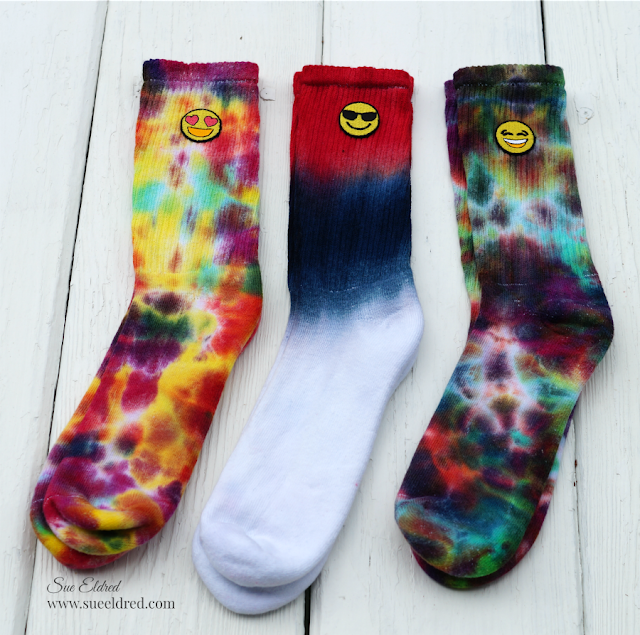 I tried three different ways to dye my socks. 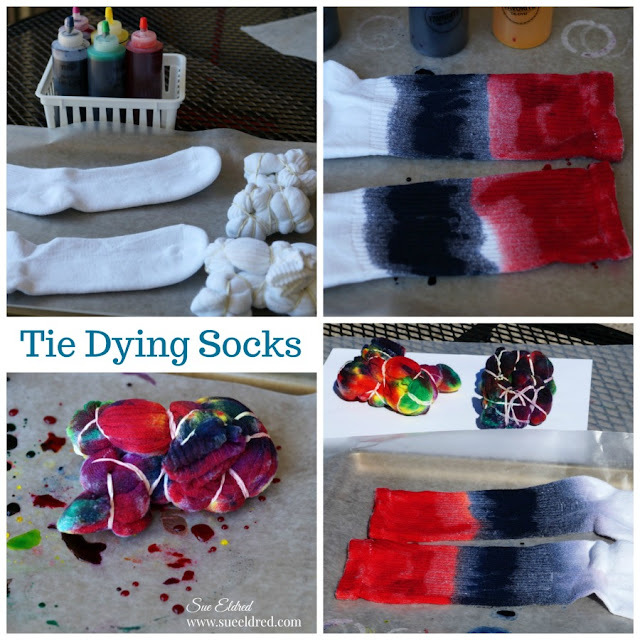 First I just squirted dye directly onto the socks (red/blue pair). Next, I rubber-banded two socks together (yellowish pair). Then I tried rubber-banding each socks separately (purplish pair). 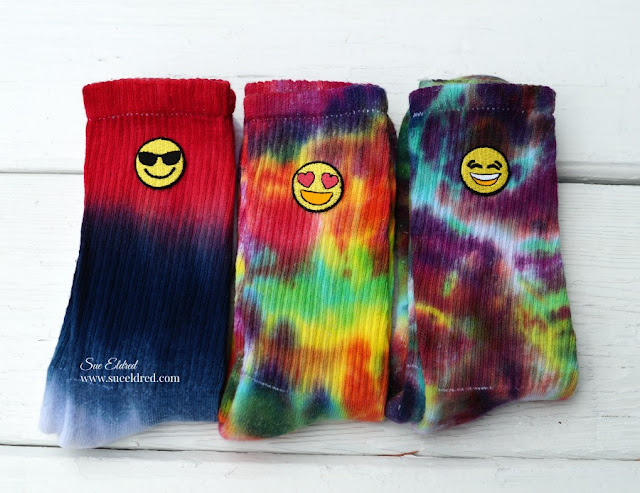 I think I like the socks on the left, rubber-banded together, the best. Let set for 6-8 hours, then rinse - waiting is the hardest part! Wash and dry your new socks, then iron an emoji to the outer side of each sock. Cool! 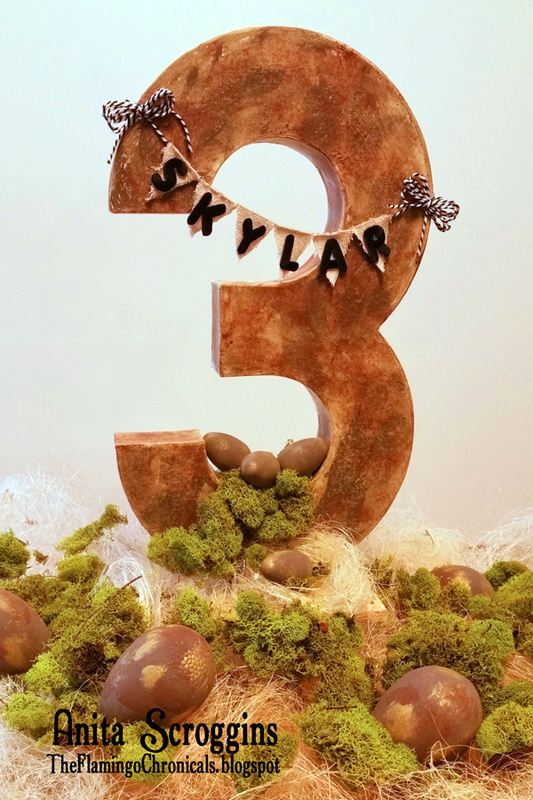 It is almost time for my princess's birthday and we are having a dinosaur party this year - so of course we need a dinosaur-themed centerpiece. There will be a lot going on at the party table and I wanted something to really stand out - and up! So I created this fun dino-scape. Of course the centerpiece had to have the birthday girl's name on it, so I pulled out my Joy embroidered iron-on letters and some canvas I had on hand. 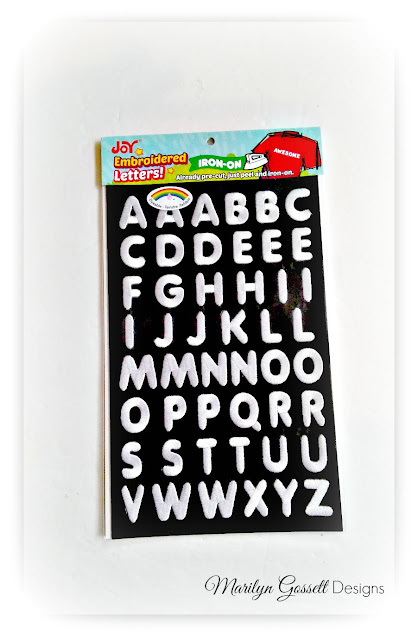 This style of letter comes in a variety of colors - they are so fun to use on all your projects! I traced a pennant shape onto the canvas and cut them out. 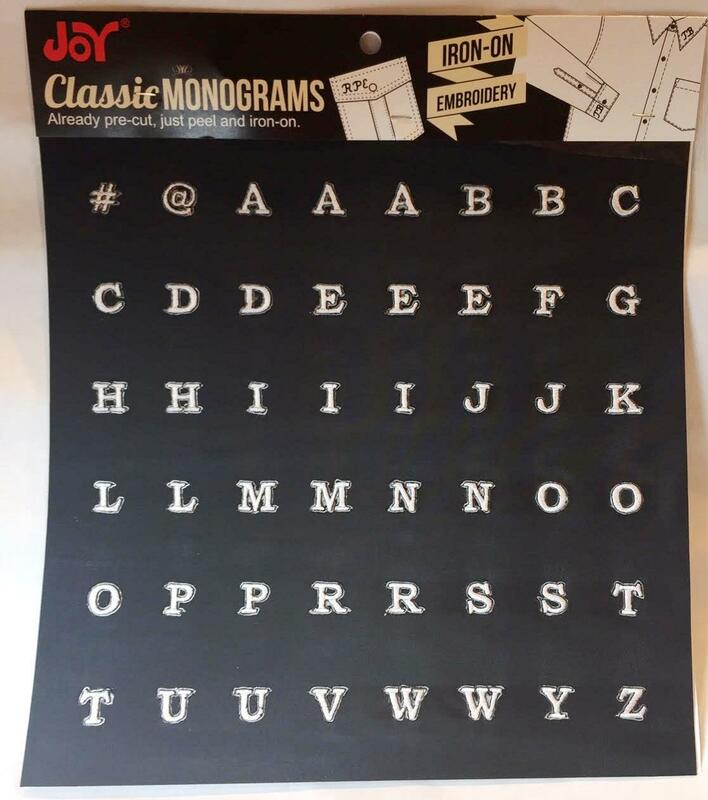 I used my mini iron to adhere the letters to the canvas following the instructions on the packaging. hobby stores in a variety of fonts, colors and sizes. In a few short weeks, I will be attending Boy Scout summer camp with my son and his troop. One of the Boy Scout's mottos is "Be Prepared." 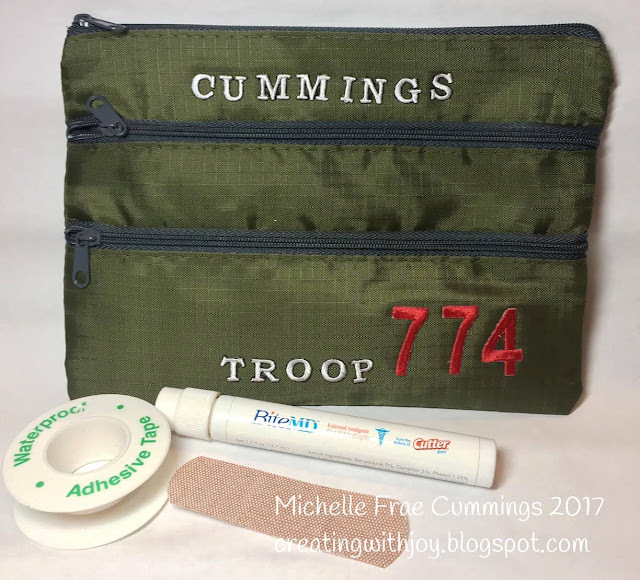 So I plan on being prepared with this personalized first aid kit! 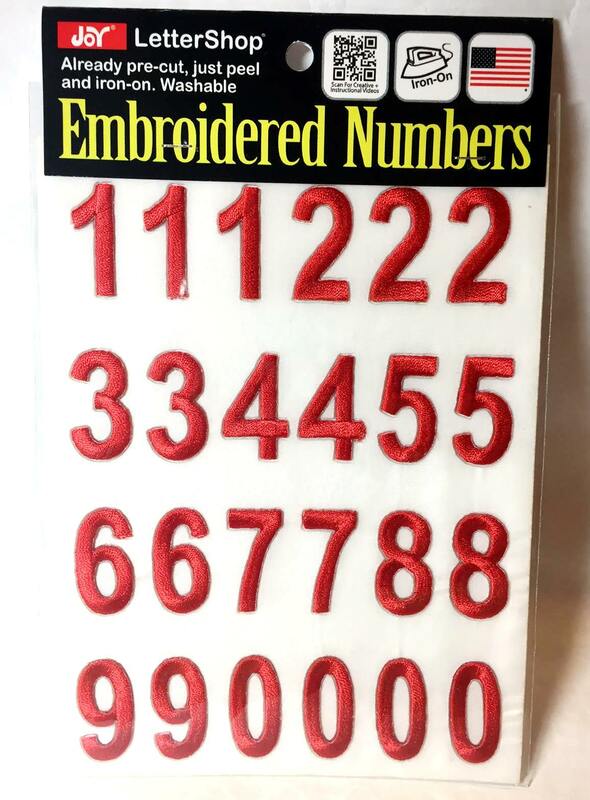 Iron-on your numbers and letters to your pouch according to the Joy package directions. Use a pressing cloth to prevent damaging the bag if it's made of nylon. 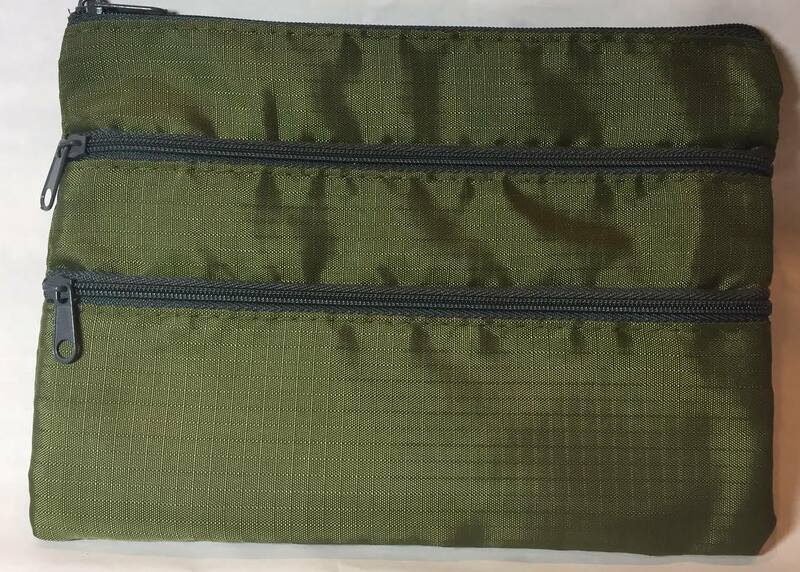 Fill the zippered compartments with first aid items, and done! Are you planning on doing some entertaining during the coming summer months? I sure am! We have extended the living quarters from inside of the house to the backyard and deck. Anticipating hot sunny days, I have made up a bunch of emoji fans for guests who come to enjoy the dog days of summer with us. 1. Cut scrapbook paper into squares to fit the sides of your display cube. 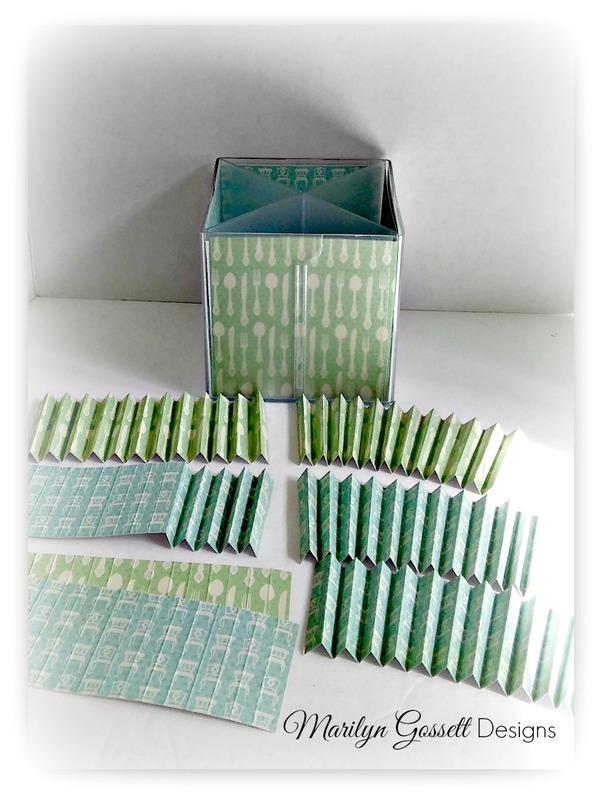 Use clear adhesive and apply the papers inside the cube. 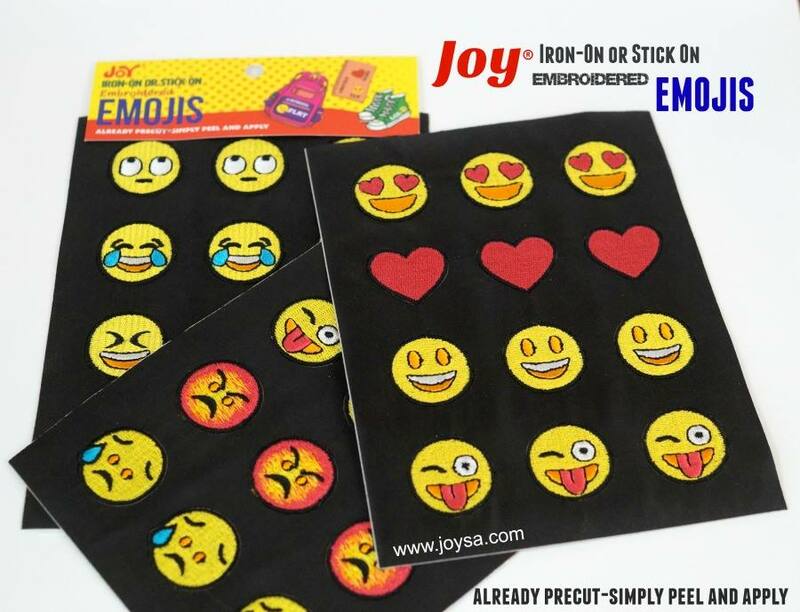 Glue some Joy emojis and a word to the front of the display cube. 2. To make a fan - measure and score one sheet of paper every 1/2" from the top to the bottom. Cut into four 3x12" strips. 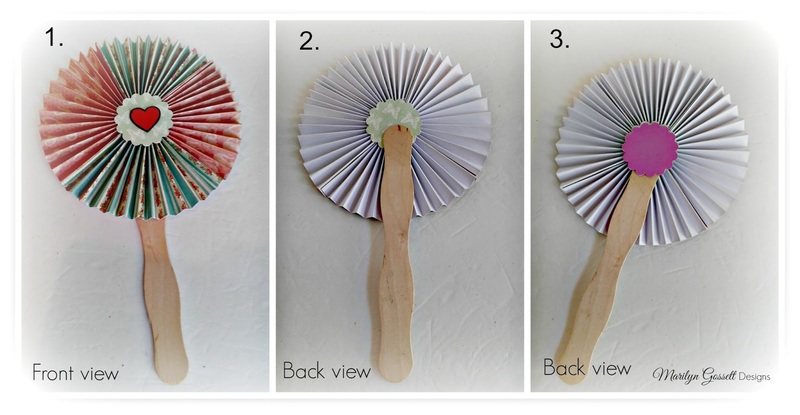 Apply glue to the end of one fan-folded strip, match up to a contrasting pattern and adhere. Repeat, gluing all four pieces into one long strip. Glue the remaining two edges together into a 'cylinder." 3. Flatten the cylinder into a circle and push the edges together toward the center until there is a 1-1/4" hole in the center. Hold in place and apply glue around the punched circle and press it over the hole. This will hold the circle fan in place. Turn the fan over and repeat for back side. Glue an emoji to the middle of the front of the fan. 4. Adhere the top of the self-adhesive craft stick to the middle of the back side of the fan. Glue a 3" circle to the center of the fan, covering the top of the handle. It's summer vacation and that means it's slumber party season. As a kid, I spent so many summer nights sleeping over at my best friend's house and now my daughter is starting to experience the joy of slumber parties, too. 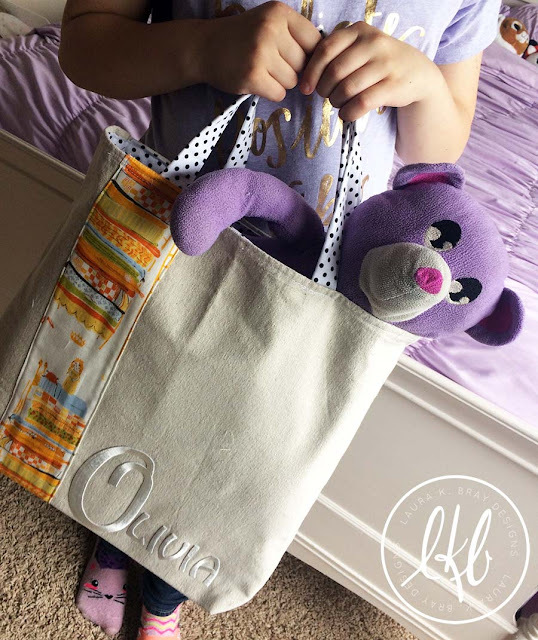 I stitched up a cute tote bag to make it easy for her to just throw in her pajamas and favorite bear, and she can head off for a fun night of staying up talking & giggling with her friends. 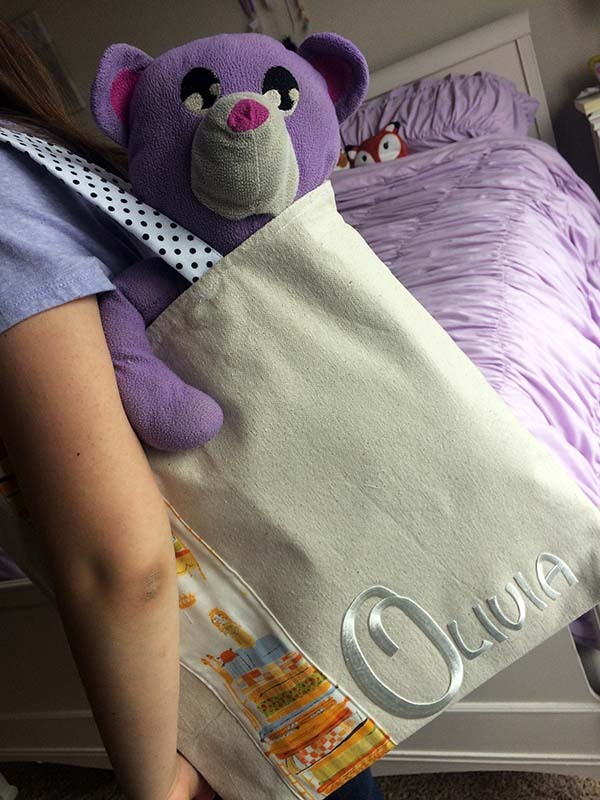 I used Joy Letters to personalize the tote with her name because she frequently forgets things at people's houses. Now there's a better chance her belongings will make it back home. 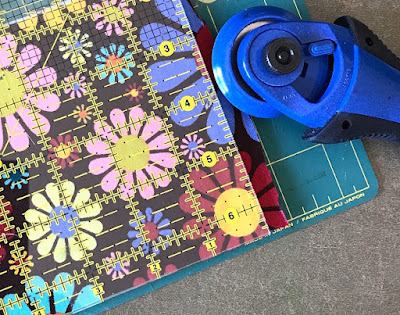 To sew a slumber party tote bag, I used the "Library Bag" instructions from the book, Sewing Bits and Pieces: 35 Projects Using Fabric Scraps by Sandi Henderson. I added the monograms and made some size adjustments to suit my needs. 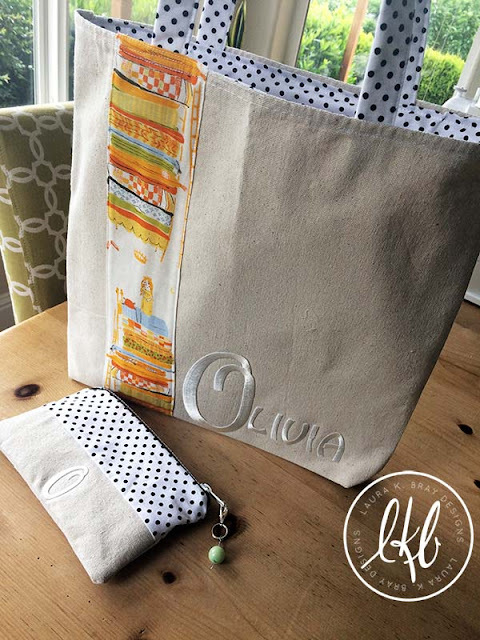 You can use any of your favorite tote bag tutorials or patterns to create a similar bag. Press the raw edges of the 5x17" fabric under. 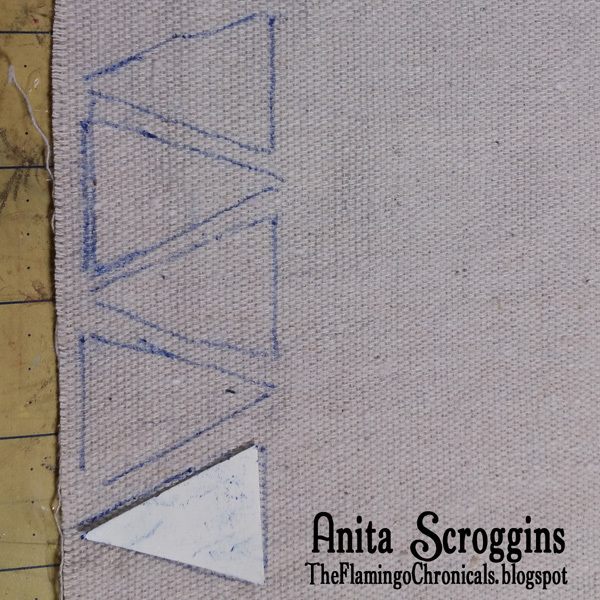 Place the strip, right side up, on one of the canvas fabric pieces, pin and top stitch it into place. 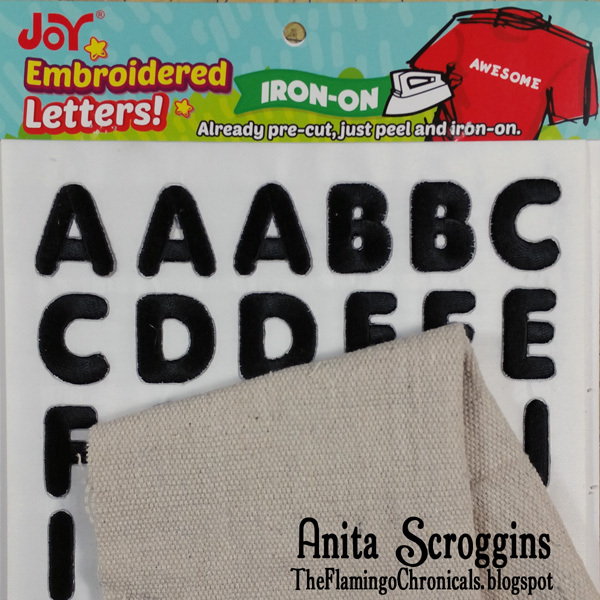 Once the fabric is stitched to the front, place the monogram letters on the fabric and iron them on per the package instructions. Iron interfacing onto the backs of the canvas pieces. Fold the top side of the canvas pieces down 1/2" and stitch to finish the top edge. Place canvas pieces together, right sides facing, and stitch around sides and bottom. Iron interfacing onto the back side of the strap fabric. Mark the middle of the strip. Fold the long edges towards the center and press. Fold in half and stitch together. 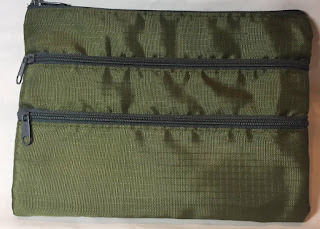 Pin the straps onto the top of the bag, 4" in from each side. Stitch in place. Fold the top side of the interior fabric pieces down 1/2" and stitch to finish the top edge. Place the interior fabrics together, right sides facing, and stitch the sides and bottom together. Want to make a gusset bottom? Watch the video on my blog for making wine gift bags to see how to create gussets. 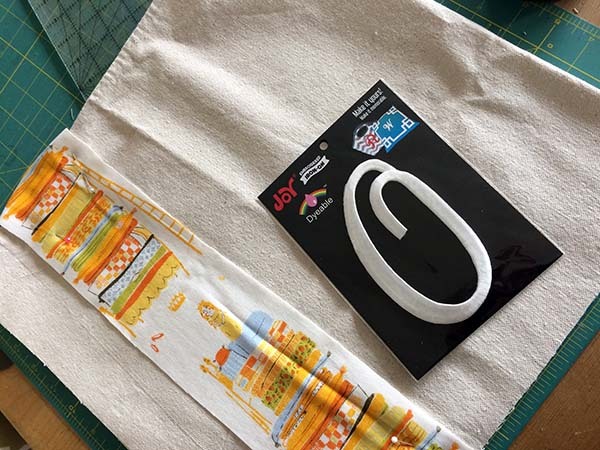 You can find Joy Letters in your local craft and fabric stores. Want to make a matching zipper pouch to go with your "Princess and the Pea" Tote Bag? 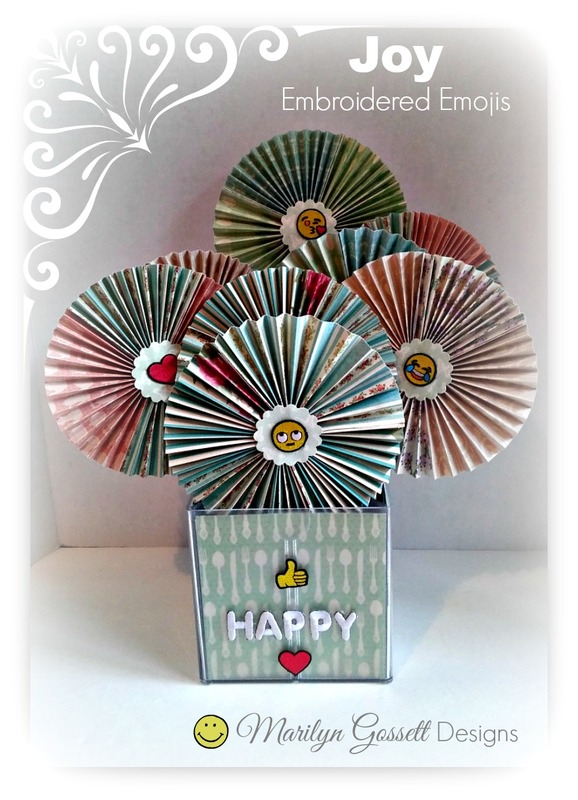 Visit my blog to get the tutorial. It even has a cute little pea charm on it! This set would make a great birthday gift for your favorite girl! 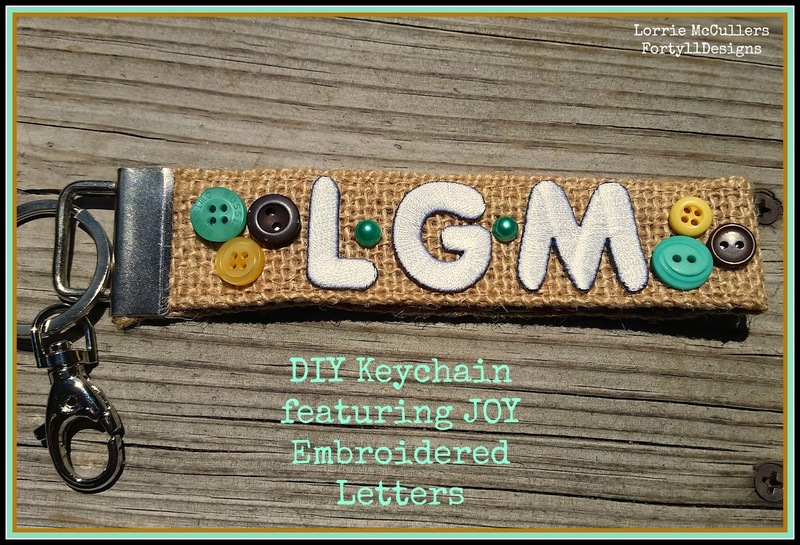 Make your own monogrammed pendant with Joy letters! Here are the initials I used - the center letter is for my last name, and the left and right letters are for my first and middle names. 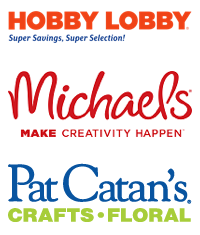 You can find these embroidered monograms at larger craft stores like Michaels and Hobby Lobby. Drill a hole in the wood circle for hanging. Drill another hole opposite for hanging the tassel. Sand and paint the circle with acrylic paint. Add water to a small amount of resin powder and paint the letters by pouncing with the brush to fill the threads. Brush gold around the edge of the circle and ddd a small amount of gold in the center Pounce over the top with more paint. 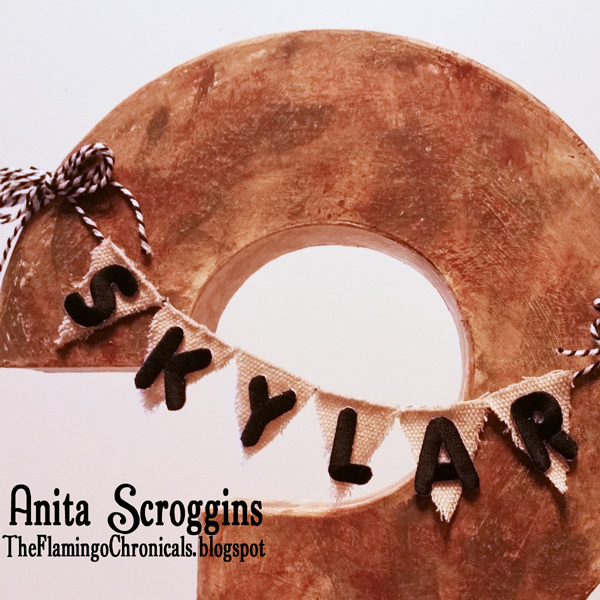 Use a hot craft iron to press and adhere the letters to the wood circle. Make or purchase a tassel and attach it to the circle with a jump ring. Add a jump ring to the top hole and attach a chain or lengths of fibers.